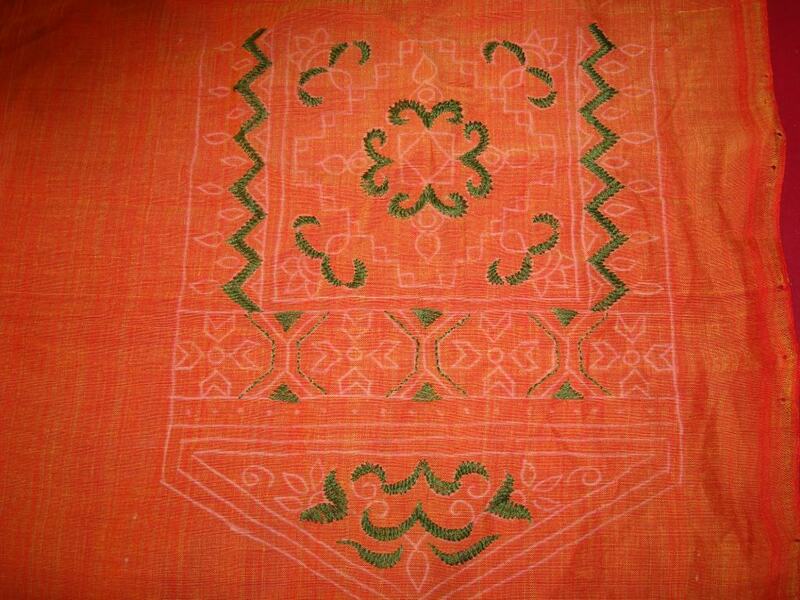 After working with the green and golden colour thread, I proceeded with pink thread. All the flower outlining were in stem stitch with pink thread. 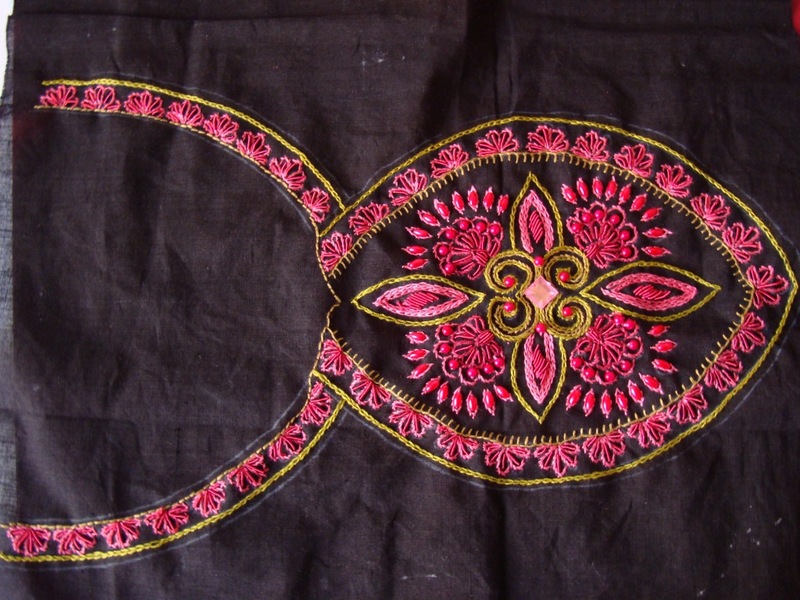 For the centre, chain stitches were worked in pink thread. I don’t have the pictures of the work in progress. Once the embroidery was completed , I started with the beads- the beads used were medium sized round pink beads and oval pink beads. A pink stone was stitched to the centre. The petals were filled with pink zardosi beads. When my nephew saw the yoke like this, he said it looked like a cow[the neckline looked like horns for him!] LOL! 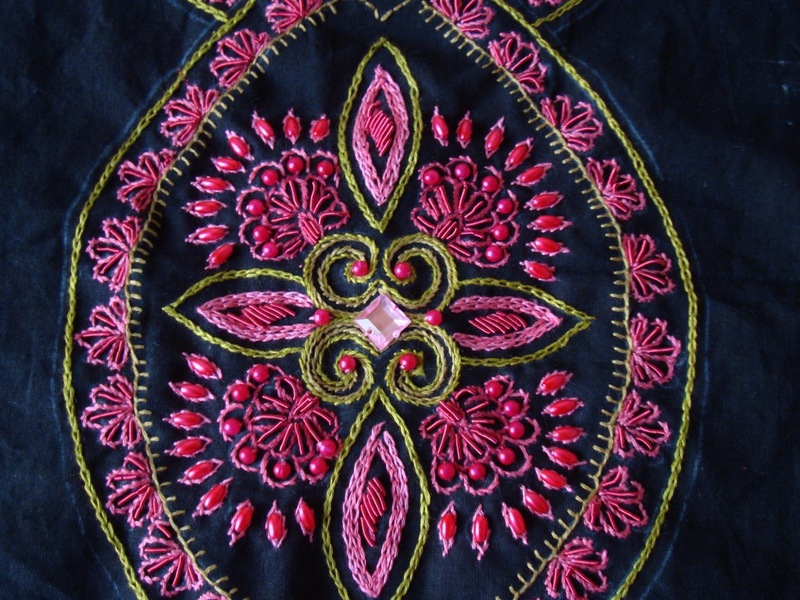 I had worked on a black yoke , for a pink tussar tunic, which is posted here. When my new niece saw this , she wanted one like that. So did the same combination for her. So , Iam just posting the yoke here. I did not take pictures during the WIP stage , though. I started with light gold colour thread and green thread. The stitches used were back stitch, buttonhole stitch, stem stitch and chain stitch. Zardosi beads and oval pink beads were added in the next stage. Those will on my next post. 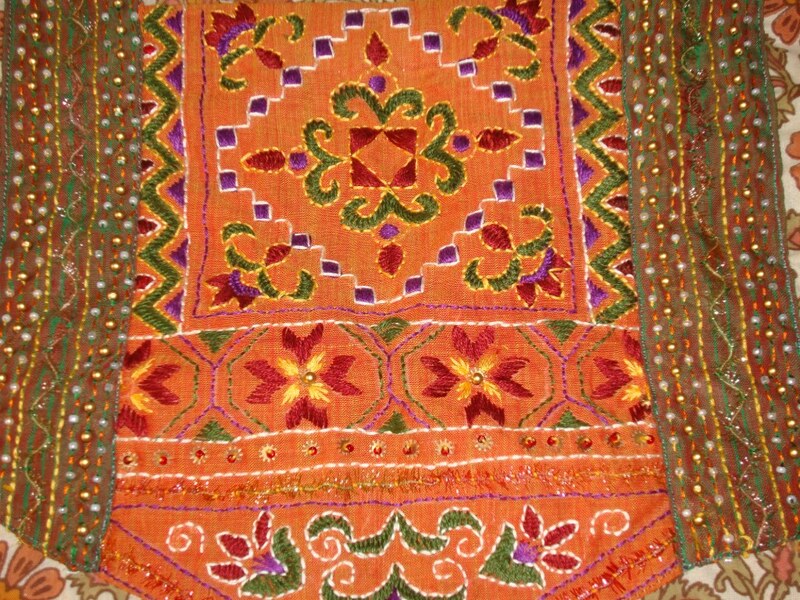 Rim jim thread, sequins and antique golden beads were stitched on to the yoke as embellishments. More time was taken working on the borders. Yoke embroidery did not take much time, but I finished the borders first, then started on the yoke. Guess I was tired of working on this piece for such a long time, I wanted to complete the yoke as early as possible, so the embellishments were kept to the minimum. When I look at the yoke now, I can see more scope for embellishments. I have worn this tunic several times, very apt for small festivities. 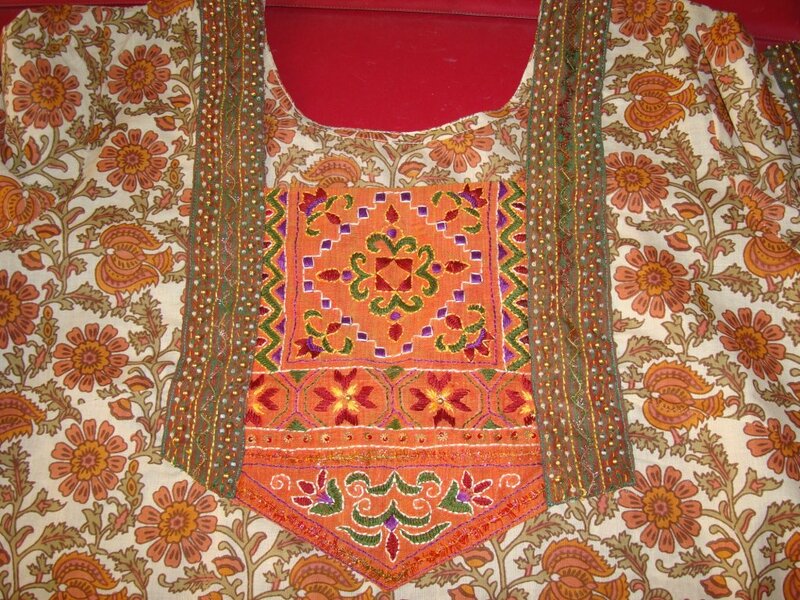 In this post, the embroidery on the yoke is detailed. The stitches worked are predominantly herring bone,with outlines worked in back st. 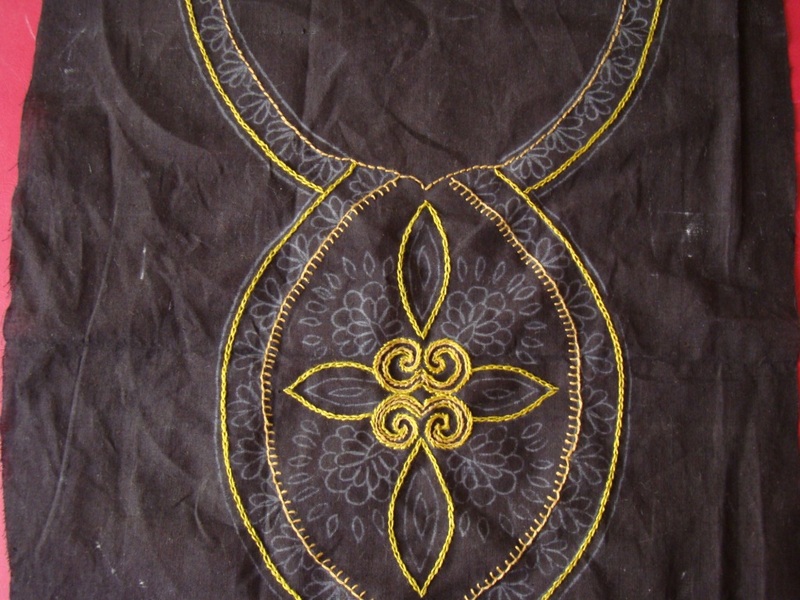 The outlines are worked in back stitch in cream and yellow. The fully completed yoke with beads on my next post. 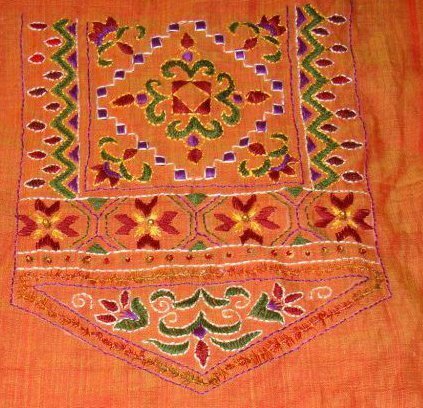 The idea for embroidery is taken from gujarati embroidery, the motifs are similar, but with some differences – the bead work, the straight stitches were added for embellishing. 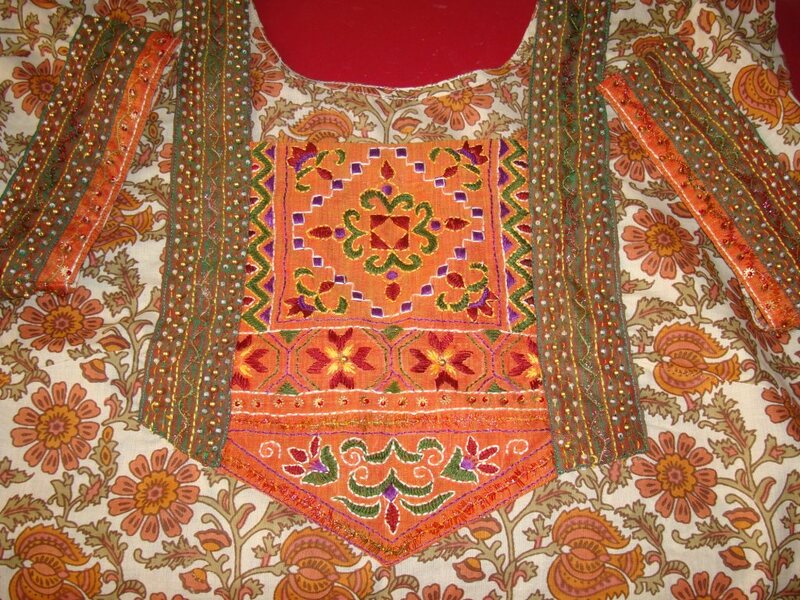 So , this is Not a authentic gujarati embroidery yoke piece. Thinking about the embellishing was easier, working on it , that too , four times ,took really long! Part of the yoke is completed with the two borders, rest of the yoke on my next post. 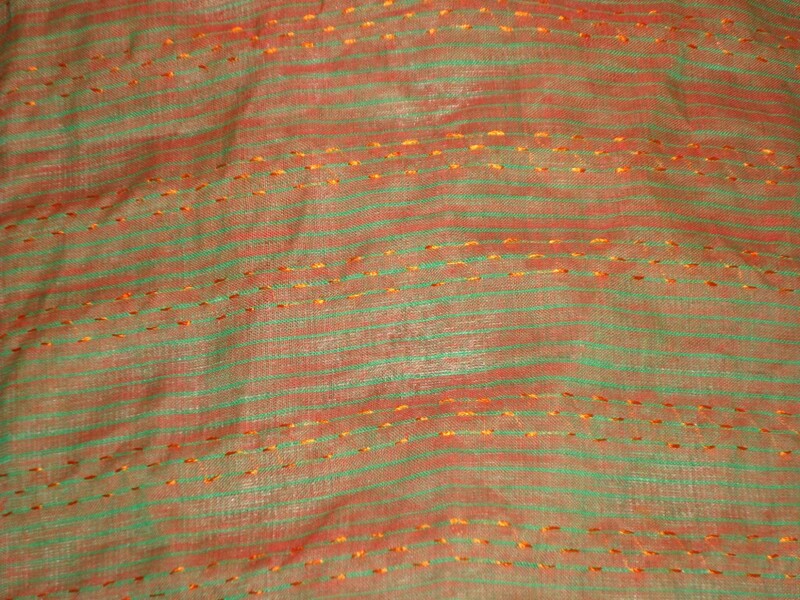 The embroidery of the second border for this tunic’s sleeves is done on greenish red mangalagiri cotton with stripes. With this stripes, I don’t have to draw lines for embroidering. 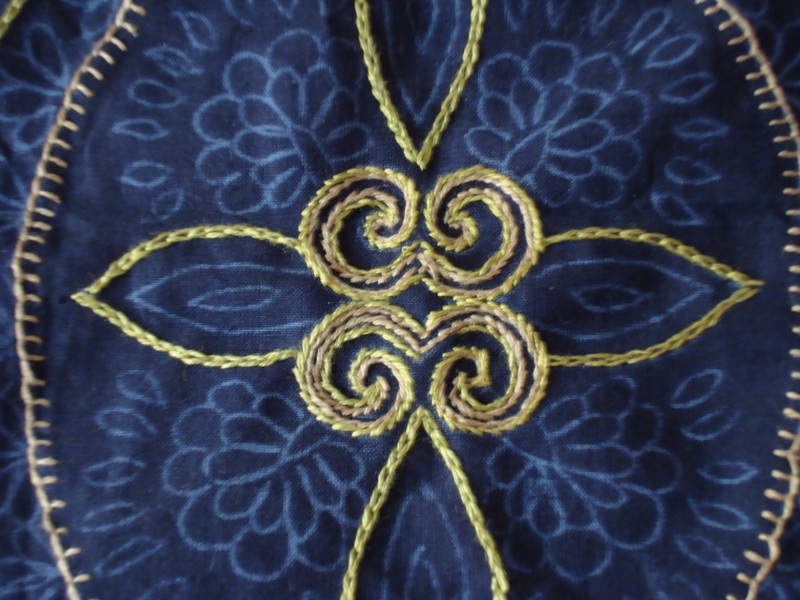 And the embroidery was also designed in such a way to use these lines as markings. I did four patches of this borders- two for sleeves[long] and two for the yoke borders[short]. The embroidery is the same for both. Small straight stitches in green were worked in the centre – for the rim jim thread to weave through. And two lines of back stitches are worked in yellow thread in between the running stitch lines and the straight stitchline. 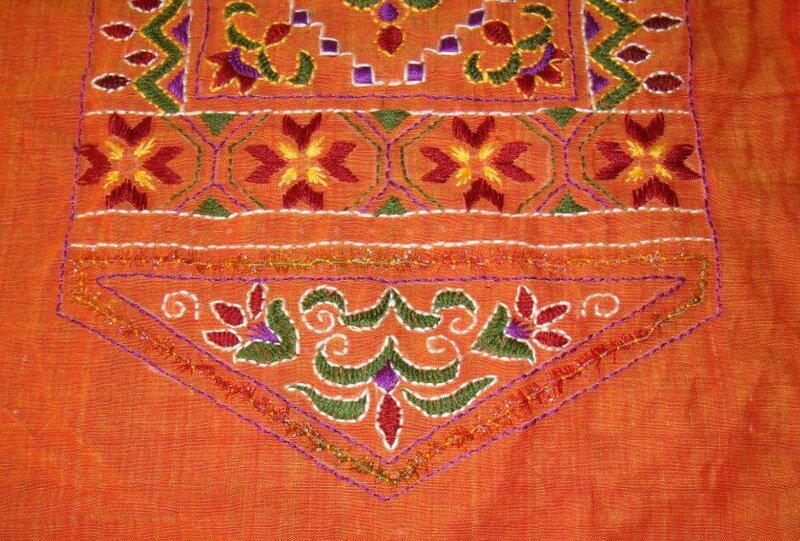 The bead work on this border on my next post. Iam posting these details of this border because, these can be incorporated for any decorative seam. 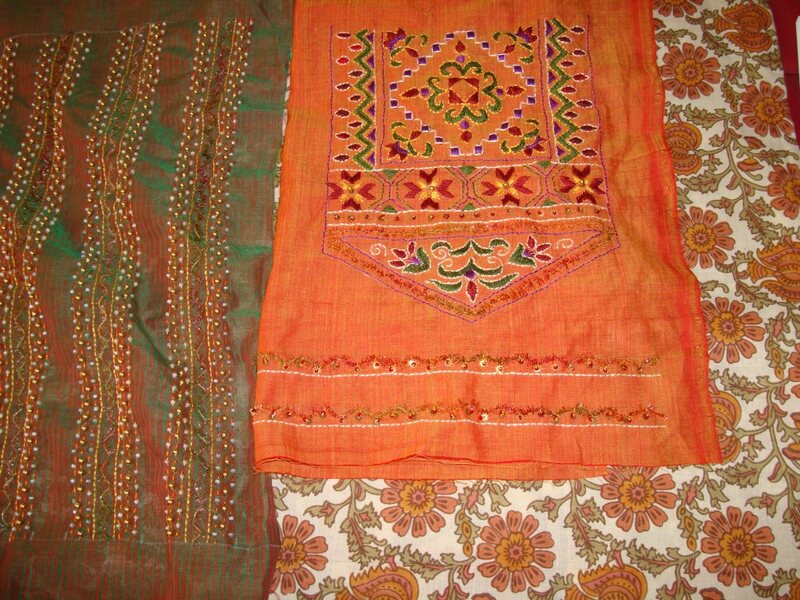 This tunic has yoke and sleeves embroidered on two fabrics- greenish red and orange. A line of back stitch worked in cream, over that I wanted the rim jim thread going in a zig zag pattern. 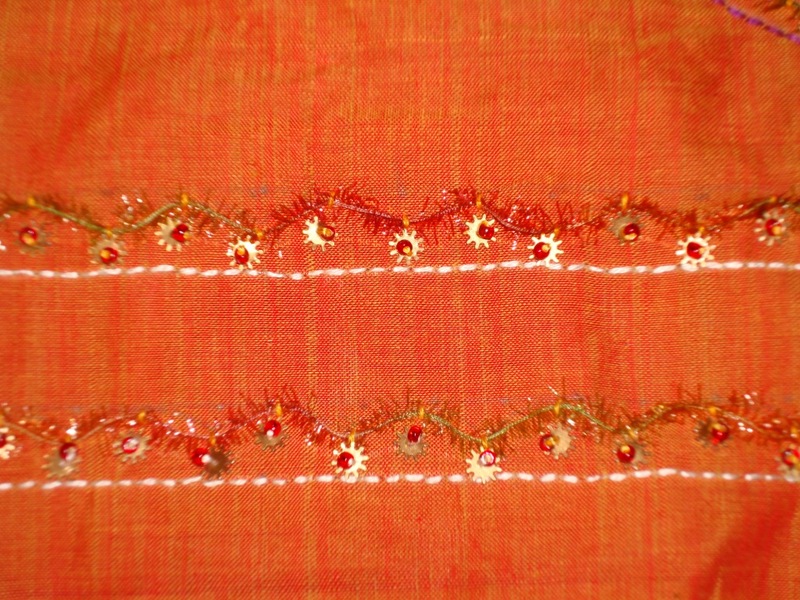 For this small straight stitches were worked in light yellow colour thread , and the rim jim thread was just passed through these small stitches. 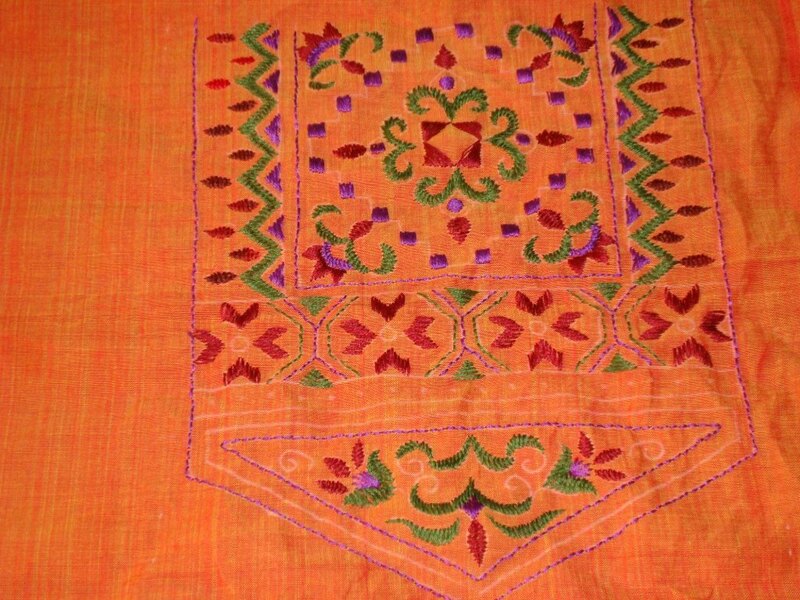 This border is done only for the sleeves, the yoke does not have a this detailing on it. The detailing of the other border for the sleeves on my next post.